Over 4 million people have diabetes in the UK and yet people with the disease spend no more than 2 hours with their GPs annually. With £25,000 of the NHS budget spent on diabetes every minute, and £1.3bn spent on outpatient costs, the Diabetes.co.uk Forum is likely to be saving the NHS a momentous amount of money. 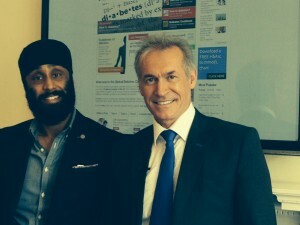 Digital Entrepreneur Arjun Panesar created online support community Diabetes.co.uk in response to this. After his grandfather was misdiagnosed with diabetes in 2006, he had a brainwave – to connect people with diabetes together as they were best placed to help others with the day to day aspect of living with the condition. Launched in 2007 as the first digital support community to talk about diabetes, Diabetes.co.uk is now the world’s largest diabetes support community with over 107,000 people with diabetes, parents, carers and friends talking about life with diabetes. The forum not only provides a valuable platform for people with diabetes, but is growing rapidly and leading the evolution of the UK’s health landscape. Whether it’s on a computer, tablet or mobile device through the Diabetes.co.uk Forum App, being connected to a patient-to-patient support network is helping shape health policies and attitudes. 35% said they had reduced their HbA1c (a reduction in HbA1c of just 1% means that a person with diabetes is 43% less likely to have an amputation and 16% less likely to suffer heart failure). The Forum was recognised in 2013 and commended by the Quality in Care (QiC) Programmes for improving self-management and diabetes care through social interaction. When it comes to diabetes, a condition that affects blood glucose levels, what you eat, what you drink, how much you move and the way you live all affect your diabetes. The change in the UK’s health landscape doesn’t end there. Diabetes.co.uk is cited as one of “the most sophisticated examples of successful social media in healthcare”. The engagement level and reach of the Diabetes.co.uk Facebook page (https://www.facebook.com/Diabetes.co.uk) far exceeds the industry average and is connecting people on a much wider scale. Arjun Panesar, is a keen entrepreneur with a degree in Artificial Intelligence from Imperial College. No stranger to success, he aided an online financial services company’s multi-million pound sale in 2010 with his skills in community development, usability and conversion. Arjun’s sights are now set on changing the health landscape worldwide and he has started work on the launch of an international community for people with diabetes. The intention is that it will aid better diabetes management and hopefully, one day, a cure.